Today we got a new oven and it is cause for rejoicing. For the past four years we’ve used one that is older than we know, more than 100 degrees off and terribly terribly ugly. But a new oven was a luxury, and so we pushed the want aside and made do just fine. But this whole floor redo in the kitchen made us want something a bit nicer to look at and use. We figured it was a good investment considering we eat in much more than we eat out, and my world is at peace when I bake. So we indulged ourselves. Regan stayed home for the delivery this morning, then swung by Goose the Market, our favorite local food & wine market, to pick up a treat for me to make on our new stove top. He came home with an assortment of meats and cheeses as well as some Oregon pink shrimp for a stir fry. Summer is hardly the time to christen an oven by baking a loaf of bread and so we opted for some tasty Coconut Milk Curry instead. Our curry is different each time, but utilizes five main ingredients consistently. Coconut milk, red curry paste, brown sugar, fish sauce and an onion make the base of this dish, but the rest of the fixings are up to you. 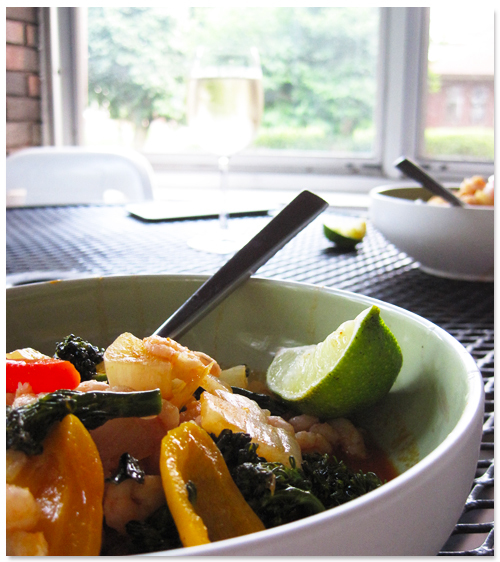 It’s inspired by a Thai Curry framework recipe provided in Fine Cooking Magazine. 1. Heat a skillet to medium heat and pour in 1/4 cup of the coconut milk, stirring and heating until thinned (about 1 minute). 2. Mix in curry paste to coconut milk with a whisk, incorporating until smooth. Then pour in remaining coconut milk. 3. 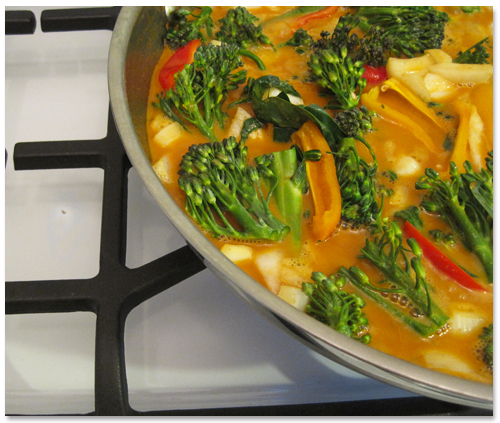 Bring coconut milk and curry paste to a simmer, then add the brown sugar and fish sauce. Incorporate well. 4. Add onions, then your two additional vegetables. Stir together. 6. Cover pan with lid and let meal simmer for 6 – 10 minutes, stirring occasionally. The curry is ready to go when the meat is cooked through. 7. Serve alone, with naan or over rice. Makes 2 – 4 servings. For this particular dish we used mixed sweet peppers and broccolini as our mix in. Our meat of choice was Oregon pink shrimp. Our drink of choice, Pinot Grigio. Together, it capped off our day perfectly. Sounds yummy amazing. I love coconut curries, too. Making my mouth water just thinking about it! 🙂 Congrats on the new stove – we have a newish one and went cheap, so it’s way off on temperatre, too. Urg. Yay! Glad to see you’re cooking coconut curry again! Woohoo on your new stove! I’m sure you’ll break it in just fine. Our little creative retreat was life changing thanks to our curry discovery!